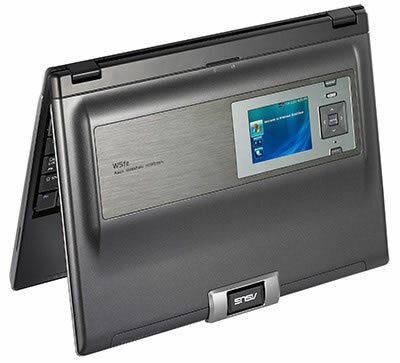 ASUS today introduced a whole new way to mobile computing with the revolutionary W5Fe series. The compact 12″ wide notebook with cutting-edge SideShow, external auxiliary display on the LCD cover, offers high mobility with quick and easy data access convenience. The Asus W5Fe, is packed with a wide range of exclusive features including, display technologies for enhanced digital entertainment enjoyment as well as high-resolution 1.3M pixel swivel webcam for wire-free video communication. The two spindle design with card reader slot and Bluetooth 2.0+EDR ensures extensive connectivity as well as ample data storage. With the launch of Microsoft’s Vista Operating System, notebooks are now capable of a more powerful processing that is predicted to change and improve the current computing behavior. SideShow is an independent operating system that it can be switched on without booting up the whole system. With imbedded 1G NAND Flash memory, users can save selected data to SideShow, in forms of text, image and audio, for later review. The W5Fe’s 2.8″ QVGA TFT LCD auxiliary display is a short cut to viewing a wide range of information, including meeting schedules, phone numbers, addresses, and recent e-mail messages. On the entertainment front, the outer display can be used to view photos, play music and games such as Solitaire. In addition, SideShow can even act as the mobile navigation device and guide the way with map display. To stay on top of the ever fast changing technology world, the Asus W5Fe is definitely the next hot digital gadget that guarantees powerful processing, sleek design, seamless integration and even a quick peek to important data without opening the notebook.